As a PYP educator, I always wondered how we could develop scientific skills in the young learners’ minds. Scientific skills are very important as they promote observation and curiosity. Curiosity has a major role in many scientific processes; young children have a natural proclivity towards the world they live in. Their day starts with asking how, why, where, who and what. Developing scientific skills in the early years will allow children to understand how the world works and how we share the planet with other living beings, and eventually allows them to develop refined understanding. All the children of my grade were agog with excitement when they saw me bringing something to class: “Ma’am, what is it? Show me, show me…!” excited, curious and eager, they swarmed around me. I told them it was a caterpillar and after the initial excitement we found a safe spot to place it. Every few minutes you would see excited faces kneeling down and looking at it. We had several discussions on where caterpillars are found, what they eat, etc. Children became responsible and collected fresh curry leaves every morning and watched the caterpillar devouring them. The greatest interest and excitement was when they saw the droppings. In this process they understood that once the food is digested, the undigested food comes out as droppings. “Ma’am, the butterfly has come out!” It was a beautiful sight indeed to see the butterfly – the Common Crow, black with white spots. How did such a big butterfly come out from such a small pupa? I was amazed to see the attributes of the learner profile developing in my students. They were curious, reflective and knowledgeable. This learning opportunity fostered conceptual understanding and a sense of curiosity in understanding a complex topic like the ‘life cycle of a butterfly’. Unknowingly the children developed vocabulary and they were able to make up their own story which they named ‘Sweetie – the beautiful butterfly’. This experience motivated and allowed me to rethink my planning and was instrumental to create a scientific inquiry corner in the classroom. I started keeping artifacts like an empty nest, live earth worms, a millipede, the caterpillar of a moth, germinating seeds etc. Nature is the best teacher to create enthusiasm and develop observation skills in students. This set a mood to our theme Sharing the planet and to understand our central idea: ‘Caring helps plants and animals to be healthy’ and in turn to comprehend one of the lines of inquiry – ‘growth of plants and animals’. It has also helped the students to develop love for nature and become good observers and inquirers. 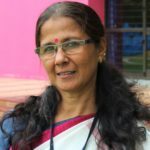 Ms. Mahalakshmi has been an early years educator since 1984 and has been with the IB for the past three years. She worked in the capacity of a teacher trainer and principal of a preschool. Teaching children through nature has always been her passion and she believes children become curious, observant, caring, enthusiastic, knowledgeable, good inquirers and communicators in the process of learning through and with nature.